We’re more than a gym at Steel Fitness Riverport — we have the programs and equipment you need to succeed in your weight loss program. With our numerous activities and amenities, we know you’ll find an exercise you’ll enjoy — and commit yourself to — as you work toward better health and wellness. At our fitness center, we recommend cardio training, group fitness classes, and personal training to build the best weight loss program. 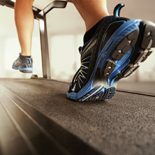 Our cardio training equipment will boost your metabolism and rev your heart rate to burn calories; you can either participate in a group class or enjoy the solitude of working out at your own pace on our single station cardio equipment like bikes, ellipticals and treadmills. Group fitness classes are dynamic and fun, and working out with others keeps you accountable and motivated. Our certified instructors will lead you through high-intensity body-toning classes like spinning or TRX training — or lower impact activities like yoga or pilates. Or have fun while you exercise with zumba! Personal training ensures that you set achievable goals, based on your fitness level, then our coaches motivate you to succeed. For the best weight loss program in Bethlehem, visit Steel Fitness Riverport. Check us out with a free trial membership — and get ready for health and wellness success!